CATLIN, George. 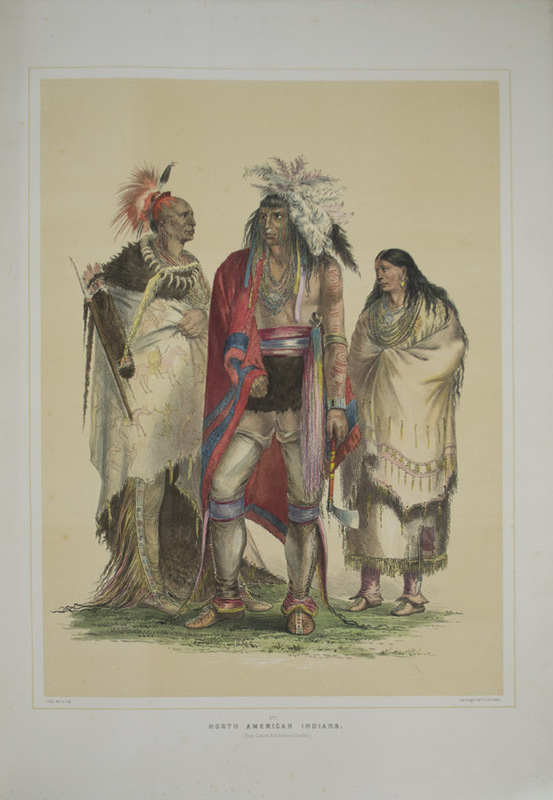 Catlin's North American Indian Portfolio. 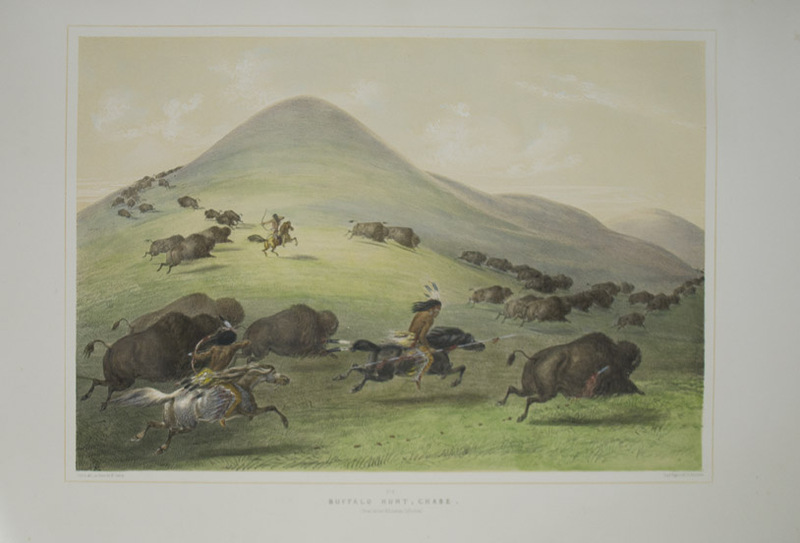 Hunting Scenes and Amusements of the Rocky Mountains and Prairies of America. From drawings and notes of the author, made during eight years travel amongst forty-eight of the wildest and most remote tribes of savages in North America. London: Geo. Catlin/Egyptian Hall [but Chatto & Windus] , [1844-1875]. Best and expanded edition. One of 350 copies. Large folio (23 1/4 x 16 7/8 inches; 589 x 428 mm). With thirty-one original hand-colored plates. Plates after Catlin, by Catlin and McGahey, lithographs by Day and Haghe. Bound without title-page and list of plates which is not uncommon for this book. Each plate with tissue-guard. Half red morocco over contemporary marbled boards. Spine ruled in black and gilt. Spine lettered in gilt. Some very minor spotting, occasionally to margins, but plates very clean. Overall very good. 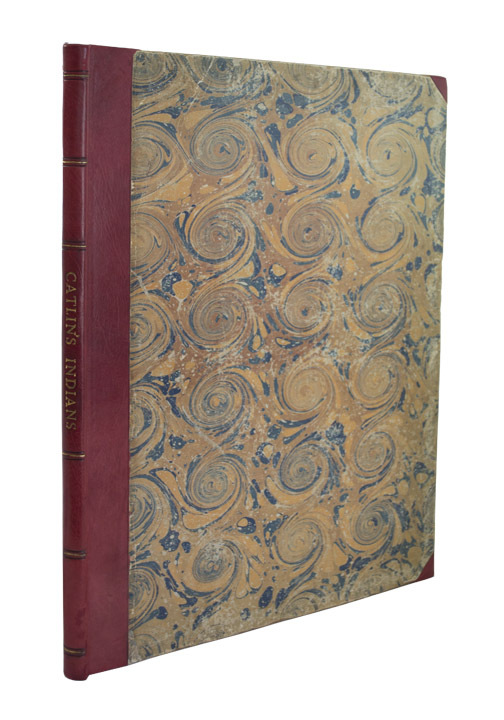 Catlin published the first two issues of the North American Indian Portfolio simultaneously in late November 1844, both of which are now very rare. Catlin originally envisaged publishing a series of linked but separate portfolios, each with its own theme: religious rites, dances, costumes, etc. Unfortunately, the first series was the only one that was ever published, and its production proved to be so taxing (both financially and physically) that Catlin sold both the publication and distribution rights to Henry Bohn. In the mid-1870s, Chatto & Windus acquired the rights and stock from Henry Bohn. They went on to publish this present edition from the left over plates of the first edition, with an additional six plates that were not published with the first edition. These six plates were in fact executed originally with the other 25, but were never used in the first edtition. These additional plates are entitled "The War Dance," "The Scalp Dance," "Buffaloe Hunting," "Mah-to-Toh-Pa," "Joc-O-Sot," and "Ojibbeways." A highly important record of a “truly lofty and noble race...A numerous nation of human beings...three-fourths of whose country has fallen into the possession of civilized man...twelve million of whose bodies have fattened the soil in the meantime; who have fallen victims to whiskey, the smallpox, and the bayonet” (Catlin). Catlin's North American Indian Portfolio contains the results of his years of painting, living with and travelling amongst the Great Plains Indians. Catlin summarized the Native American as "an honest, hospitable, faithful, brave, warlike, cruel, revengeful, relentless -- yet honorable, contemplative and religious being". 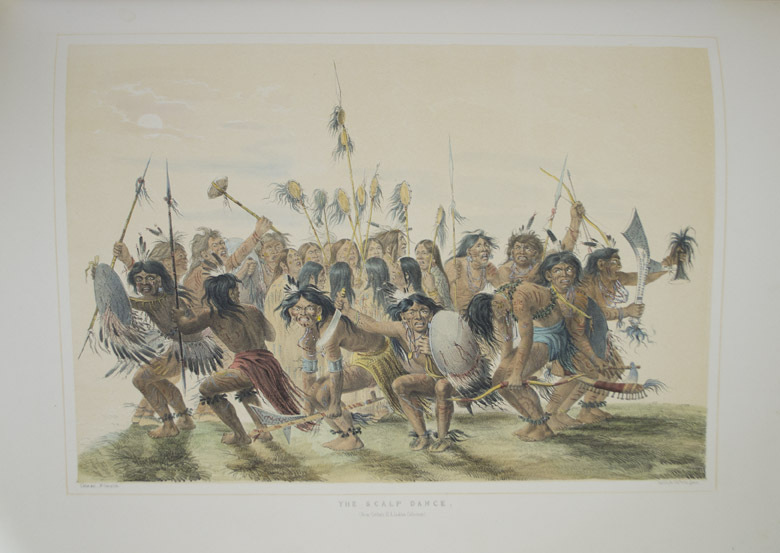 In a famous passage from the preface of his North American Indian Portfolio, Catlin describes how the sight of several tribal chiefs in Philadelphia led to his resolution to record their way of life: "the history and customs of such a people, preserved by pictorial illustrations, are themes worthy of the lifetime of one man, and nothing short of the loss of my life shall prevent me from visiting their country and becoming their historian". He saw no future for either their way of life or their very existence, and with these thoughts always at the back of his mind he worked, against time, setting himself a truly punishing schedule, to record what he saw. From 1832 to 1837 he spent the summer months sketching the tribes and then finished his pictures in oil during the winter. The record he left is unique, both in its breadth and also in the sympathetic understanding that his images constantly demonstrate. A selection of the greatest of images from this record were published in the North American Indian Portfolio in an effort to reach as wide an audience as possible. 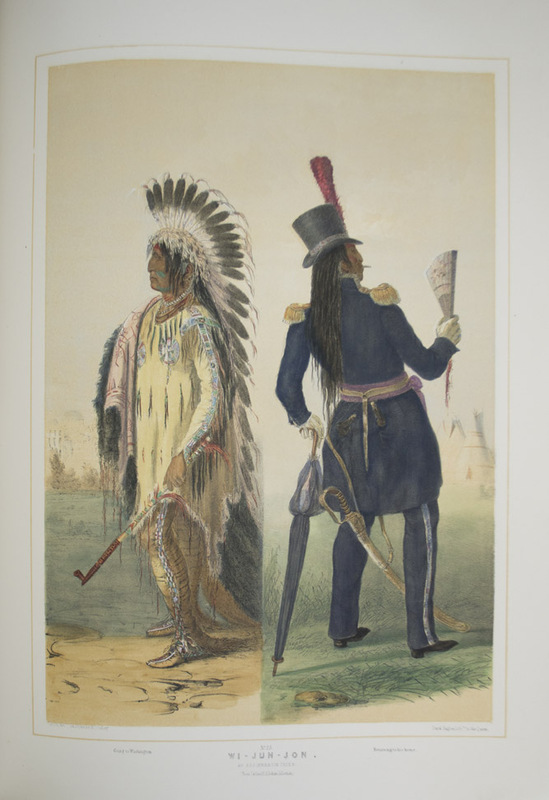 In addition to publishing the present work, Catlin also spent from 1837 to 1852 touring the United Stated, England, France, and Holland with his collection of paintings, examples of Indian crafts and accompanied by representative members of the Indian tribes. A financial reverse in 1852 meant that he lost the collection, but he spent his later years making several trips to South and Central America, sketching the natives there. Howes C-243. Sabin 11532. Streeter. Wagner-Camp 105a:3.